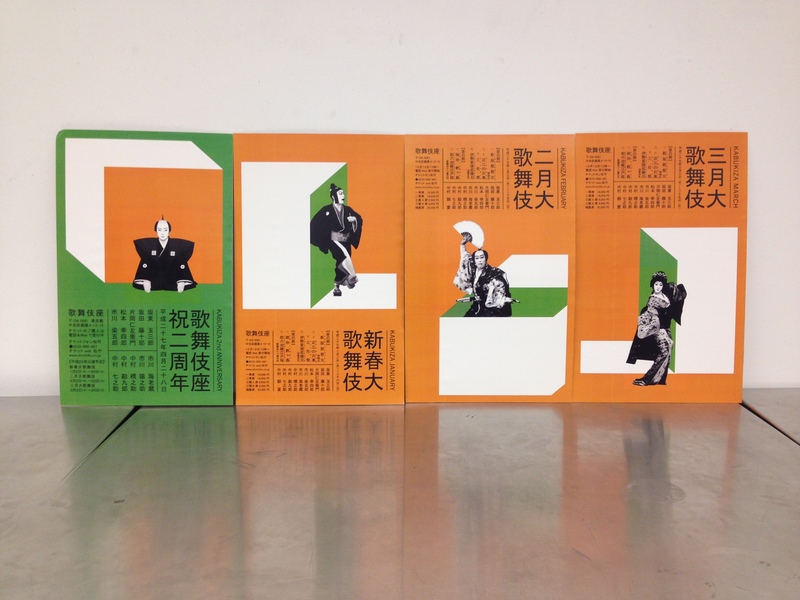 AMT caught up with AAS Graphic Design Student Yoko Nire during her final semester at Parsons. Hear more about Yoko below! 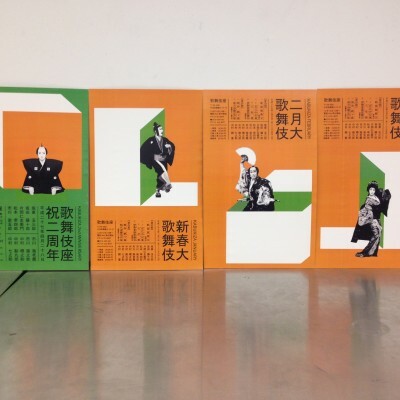 An image from a poster series for the Japanese traditional theatre Kabuki-za, the Japanese theatre for Kabuki in Toyko. What are you currently doing this semester? I am taking 4 classes and doing an internship at a small design studio. The internship is mostly about editorial design for the New Museum catalog. What are some of your favorite classes and with who? why are they your favorite? I am currently taking Graphic Design 3, GD+Silkscreen and Advanced Typography. In Graphic Design 3, all of the projects are very interesting. They are practical and conceptual at the same time. 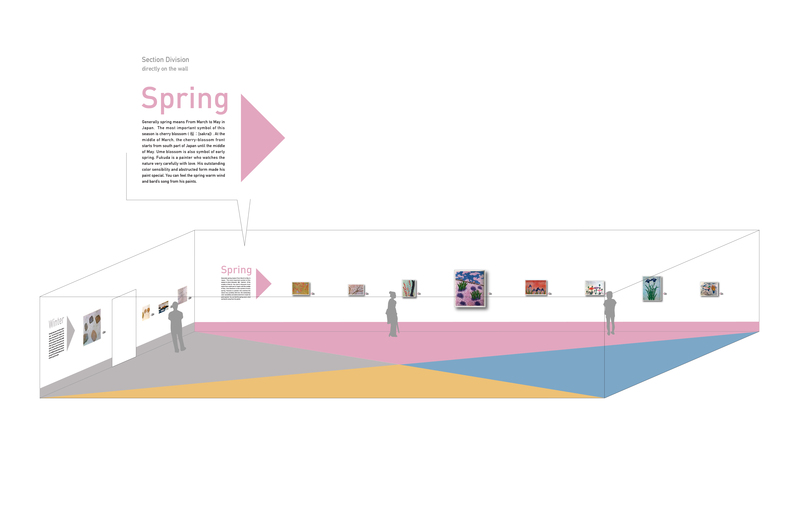 Recently we did an exhibition design project in which we chose a subject and designed a space and graphic elements. It is the first time I designed a space and I enjoyed it. Now we are doing 2 projects at the same time, a poster series and a book/mapping project. They are both a little complicated and there are a lot of limitations but what I am learning in this class feels like “design as problem solving”. Whereas before this semester, I was thinking “design is creating”. Graphic Design and Silkscreen is a really tough class. Since it is a printmaking class, we have a lot of physical work but the main focus is on our typographic treatment. It is very conceptual and there are so many things to consider. It was necessary to consider silkscreen printing’s specific characteristics when we started designing. Very hard, but fun! 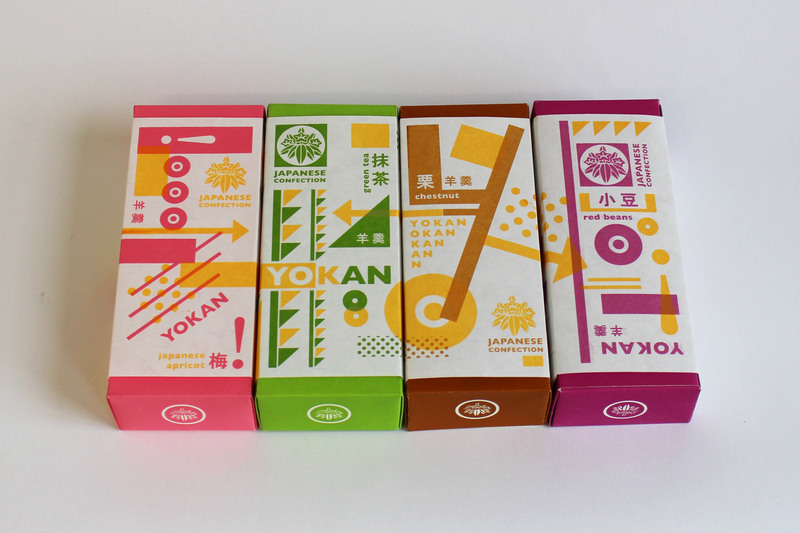 Yoko created this package design for the Japanese candy Yokan, that was inspired by the Dutch designer Piet Zwart. What is your background? How did you come to join the Parsons AAS program? I was a magazine editor in Japan for 5 years. During work, I realized that what I was interested in was the design aspect of the magazine. I was tired of my job – by this time I had became a chief editor and was working very hard. I felt like I had learned almost all that I could from the company. I wanted a change and had dreamed about studying abroad for a long time and thought it was time! I had traveled to New york before and thought about living there. So I googled “study graphic design NY” and learned that there is a school in Tokyo called Vantan that is associated with the Parsons AAS program. I entered the Vantan school and studied basic design process for a year and a half and eventually came here. 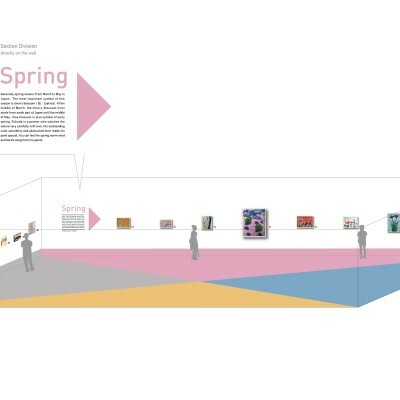 An image from Yoko’s Exhibition project titled “The Four Seasons – Heihachiro Fukuda.” The floor was purposely divided into 4 colors to make the audience feel like they are in each season’s colors. Why graphic design? What do you love about graphic design? I think I had an interest in Graphic Design for a long time. When I was very little, I loved to paint. My mother who is an opera singer introduced me to a lot of great art work – mainly Western paintings. Later, I joined the art club in high school. Then in the University, I majored in Western Art history and started to make zines as a club activities. So, I had been curious about visual communication too, I think. I also get enthusiastic when creating things. It is important to me to design some thing that is going to make people fun and happy. 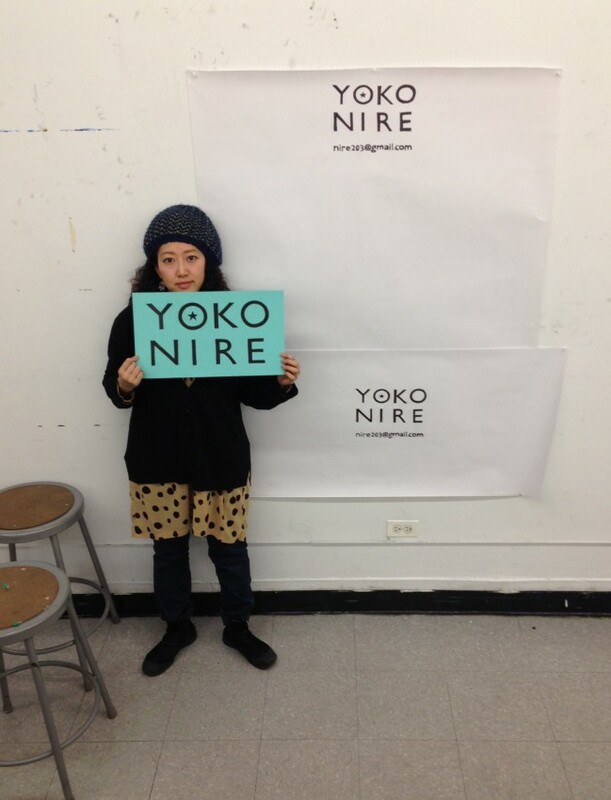 An image of Yoko with her life size business card! Thanks Yoko! Good luck with the rest of your semester! 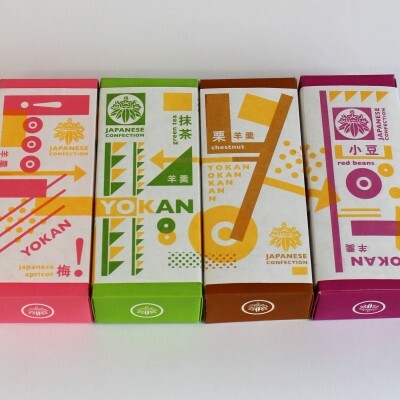 See more from Yoko’s portfolio here. « Attend the Fine Arts BFA Open Studios This Thursday!